Near the town of Bellagio, you can find the charming summer called "Villa Riva". The building dates back to the end of the eighteen century. All around the summer, a centuries-old park stretches for 15 000 sq. m. There is also a small cottage and the gatehouse. The villa, with its characteristic rectangular plan, has two floors, each of which is 216 sq. m. for a total of 432 sq. m. The house consists of two rooms: on the ground floor, there is the living room with a large fireplace, the dining room, the kitchen and the bathroom; on the first floor there is the bedroom with six bedrooms, four bathrooms, a small living room and a storage room. Two bedrooms are double while the other three have the possibility to be both double or twins. Both of shower and bath tub. Three cuddles and highchairs can be provided for free. The villa, two children, children and children, will be able to explore the garden. Nearby the summer it is possible to go for hikes, easily reaching the mountain hut called "Martina" from Lake Como is guaranteed. The closest restaurant is just 1. 2 km from the villa and it offers local cuisine based on typical products; it has a beautiful terrace with a stunning lake view. Villa Riva has a large parking lot. The house is 4. 5 km far from Bellagio and it's the perfect stay for your lake. The villa is stunning with an olde world magical feel to it! We wanted for nothing while we were there. The villa is extremely spacious, with plenty of amenities close by. The gardens are immaculate, with a grotto on the grounds! The owners are fantastic and very helpful. An absolute delightful week spent in the most beautiful setting! The house is stunning with a lovely garden. Even with 11 of there was ample space for all in the sitting room. Cooking was easy due to the very well equipped kitchen. The owner, Antonio, lives in a separate house and could not have been more helpful. We all (including our dogs) had a great holiday and would love to stay there again. You were the fantastici.Spero guests to host you for an upcoming vacation. P.S. Thanks for the wine, was excellent! My ten friends and I spent a wonderful week at Villa Riva. The property has amazing character and charm, combining 18th Century beams and stone floors with quirky 70s light fittings and art work. The kitchen was well appointed and there was plenty of room, both inside and out to eat and socialise together. Patrizia and Antonio - our hosts - were on site. They stay in a small house to the rear of the main house. They were very helpful and fixed the few small problems that came up (blown fuse & running toilet) quickly and efficiently. They were respectful of our privacy and gave us plenty of space. 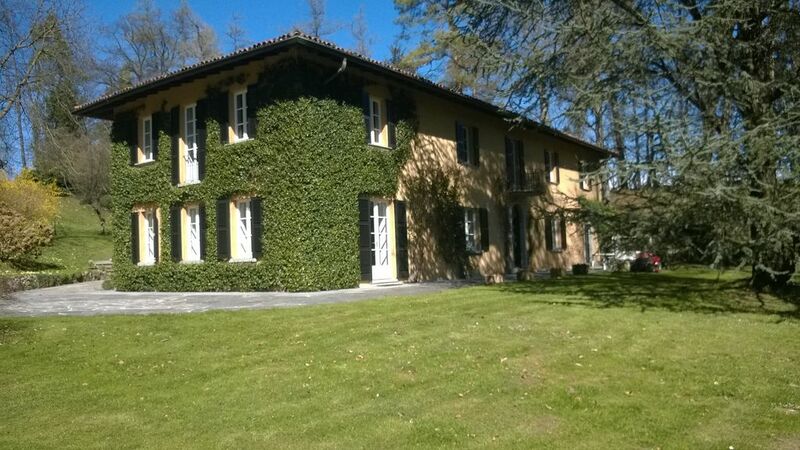 The location of the Villa is great if you are interested in spending time in Bellagio and the surrounding hills. It is above the town so you need a car to access, but it also meant that is was a lot cooler than the lakeside towns. It is also very simple to drive down to the ferry terminal and catch ferries to Varenna or Menaggio. Antonio was a wonderful source of information and recommended a number of fantastic restaurants to us. I've given the villa a rating of 4/5 rather than 5/5 because of the proximity of the rather noisy road just by the property. The road was quite busy and could be heard from the house, we quickly got used to it, but it wasn't quite the silent rural idyll we had hoped for! Thank you Patrizia and Antonio, for a wonderful holiday. We hope that we will come to stay with you again one day. Thank you very much for what you write about the Villa and us! Your warm comment encourage us to improve our welcome. Our hope is that you or some of your friends come again to visit us, perharps in May -June when there is an unbelievable explosion of flowers, or in September, when the warm colors of the end summer give a particular romantic atmosphere; in this months, a silent rural idyll is guaranteed. we are very happy with your vacation in our home, we are still waiting for you with so many children. We wish you much happiness. We loved our stay in this great villa which is incrediubly well equipped and offers a lot of space. The garden and the whole property are beautiful and we'd love to come back. My home is your home, I hope I can host you again. In the winter of 2016/2017, we had a lovely holiday in this beautiful "hunting house". The house has lots of space and is very pleasant to live in. The living room is big enough to sit 12 people, but it is still very cosy, not in the least because of the (huge) open fire place. The bedrooms are spacious and comfortable, and come complete with towels and linen. The best place of the house, though, is probably the kitchen, which is spacy and very well equipped, and therefore is an ideal place to prepare nice meals: as a result, we only ate out once during our week-long stay. The house is also superbly located to start hikes/walks from, which we did every day (although we had sometimes troubles dragging ourselves away). Civenna, at 2 km, is an excellent place to enjoy a cup of coffee (in Bar Sport) and to buy groceries. A real plus are owners Antonio and Patrizia, who very kindly welcomed us with bubbles and sweets. In addition, each day Antonio provided us with new wood for the open fire, which was very much appreciated. We warmly recommend this house, to which we hope to be able to return ourselves one day. A short distance from Bellagio, in locations Guello, lies in its enchanting setting a property of great charm and elegance called "Villa Riva." The building dates from the late '700, aimed at the country residence of the Marquis Trotti hunting. The villa is surrounded by a park of 15,000 square meters, which offers a partial view of the lake for a stay intimate and relaxing. The villa, with its characteristic rectangular plan, spread over two levels of 216 m² each, reaching a total of 432 m². It is made up of ten local distributed as follows: the ground floor living room with fireplace, dining room, kitchen, basement and bathroom toiletries. On the first floor is the sleeping area with its six bedrooms, four bathrooms and a hallway. The villa is the ideal place for your holidays, easy access and only 4.5 km from Bellagio.